PACIFIC OCEAN - Vice Adm. Nora Tyson, commander, U.S. 3rd Fleet, visited the aircraft carrier USS Nimitz (CVN 68), at sea, as part of a scheduled visit, April 14. Tyson visited Nimitz to meet with leadership and observe Carrier Strike Group (CSG) 11 during their Composite Training Unit Exercise (COMPTUEX) as they prepare for an upcoming deployment. This is Tyson’s first visit to Nimitz since 2016, after the ship completed a nearly two-year yard period at the Puget Sound Naval Shipyard and began its condensed Inter-Deployment Training Cycle (IDTC). Nimitz left its homeport of Bremerton, Wash., March 13 to begin COMPTUEX and is expected to complete the final phase of deployment training later this month. 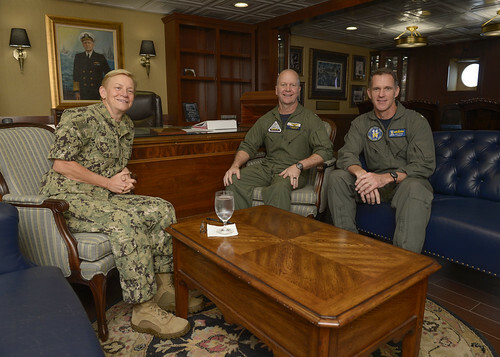 The visit also allowed Tyson to convene with Commander, CSG 11 Rear Adm. William Byrne and Commander, CSG 15 Rear Adm. Ross Myers, who is evaluating CSG 11 on their COMPTUEX performance. “I feel very confident that when you deploy later this year, our country can feel very confident and proud of this strike group as she goes west to serve in future areas of operations,” said Tyson.